Tofu and I didn’t get off to the best start. I mean, I was dubious about eating what I had already deemed to be a (barely) edible sponge anyway and then the first time I cooked it, it actually lived up to that title. I diligently avoided it for another couple of years. But tofu, I pre-judged you. And what’s more, I blamed your sponge-like qualities on YOU, completely disregarding my blatant lack of tofu-cooking finesse. Tofu, I hang my head in shame. But I gave you another chance! You see, you just needed a bit of love, didn’t you? You do inherently taste of nothing, it’s true, but that’s not your fault! And you are very open to new flavours and textures. And you didn’t complain one bit when I tossed you into a screaming hot wok. No, YOU JUST GOT BETTER. And crispy! I didn’t believe it was possible. I dredged the tofu pieces (cut small so that the crispy edge to squidgy middle ratio was more favourable) in a mixture of cornflour and Chinese 5-spice powder before giving them a good old frying. 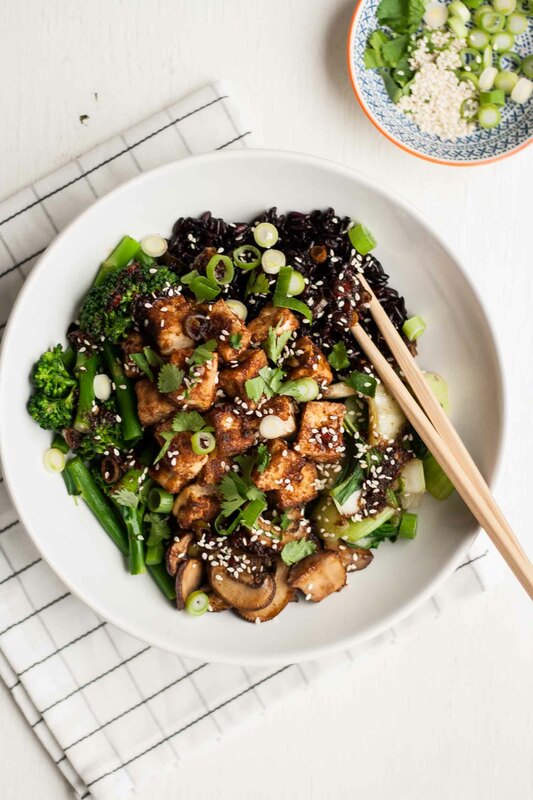 Then they got all cosy in a bowl with some sticky black rice and stir-fried mushrooms, with tenderstem broccoli and pak choi providing some happy green balance. And then I bathed it all in a super flavoursome sauce, filled with Asian flavours. And willingly ate it all. The tofu was the best bit! I know! I couldn’t believe it either. But it’s true. But that rice, though. If you haven’t tried black rice before – you must! Even though I spent like, a whole £2 on a tiny little bag of it – it’s so worth it! (And you don’t need much for this recipe so it’s all good). Black rice is nutty and chewy and apparently it’s a nutritional powerhouse too. Which is always a plus in my book. I like to get my nutrients in where I can! 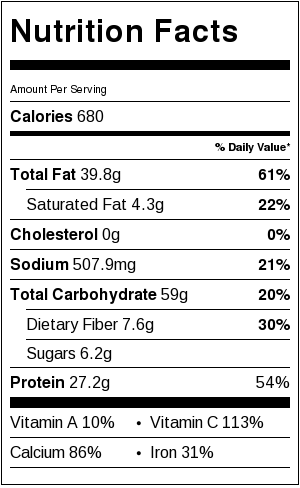 You can totally sub brown rice if you want to but I urge you to get some of the black stuff. However extortionate it may be. You’re worth it. Just have a closer look at that tofu. It’s so golden and delicious and just begging for you to dig right in! 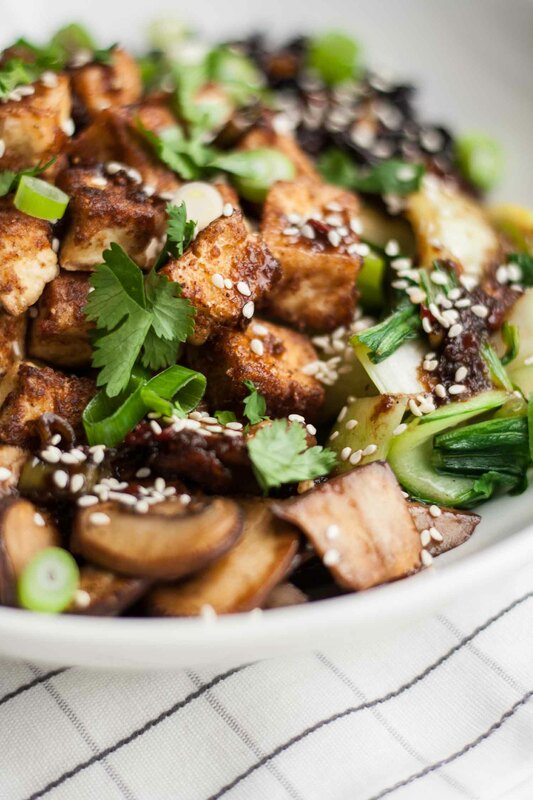 Give this recipe a go and give tofu the love it deserves. 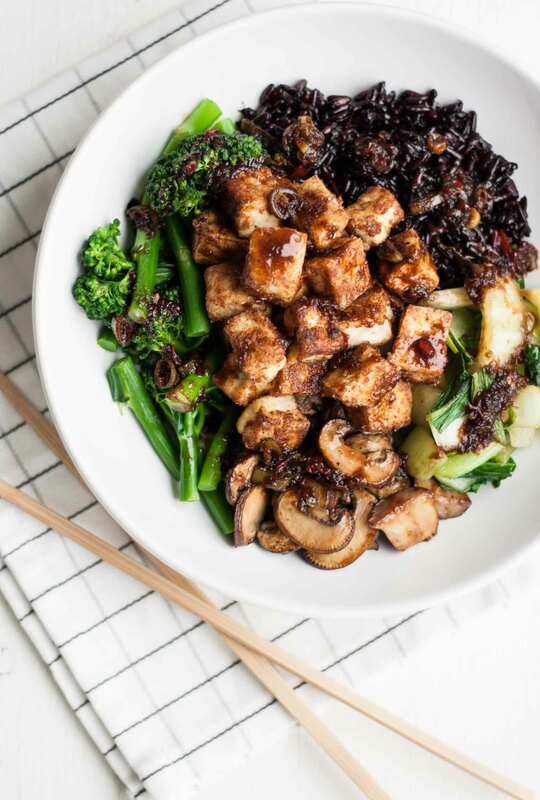 And if you needed anymore convincing, this crispy tofu black rice bowl is completely vegan whilst tasting decidedly meaty and umami and just generally awesome. What more could you possibly need? Behold! 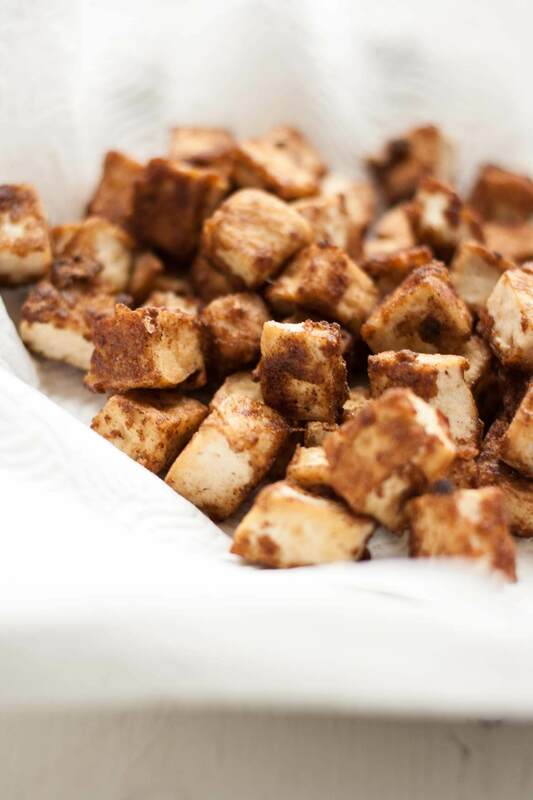 The recipe to convert even the most zealous tofu-sceptic in your life. You’re welcome. First prepare the tofu. Cut into 1 cm thick slices. Line a plate with a few pieces of kitchen paper and place the tofu slices on top. Cover with a few more pieces of kitchen paper, another plate and place something heavy (a couple of cans will do) on top. Leave to press whilst you prepare the other ingredients, at least 10 minutes or so. You may need to change the paper halfway through. Cook the black rice. Rinse and place in a small saucepan with a pinch of salt and a cup (250 ml) of cold water. Bring to the boil, stir once and place a lid on the pan. Turn the heat down low and cook for about 25 minutes, until tender. You can rinse it once cooked, but I like it when it's a bit sticky. Once the tofu is dry, cut into 1 cm dice. Sprinkle with the cornflour, 5-spice powder, chilli powder and a good pinch of salt and toss well. Heat the oil in a wok or large frying pan. Add the tofu (I did this is two batches) and fry until golden brown and crispy - this took 2-3 minutes for me. Transfer to some more kitchen paper to drain. Stir fry the mushrooms, broccoli and pak choi, adding more oil if needed. 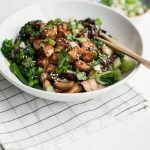 Place in a bowl along with some rice and crispy tofu pieces. Place all ingredients for the sauce in your empty wok or frying pan and bring to the boil. Cook for a minute until slightly thickened and pour over the rice, veggies and tofu. Garnish with the spring onions, coriander and sesame seeds, if liked and serve. PS. Let’s not talk about the fact that those chopsticks were nothing but a prop and most definitely were not used to transport any tofu cubes towards my face. I am desperately incapable of using those ridiculous implements. Once, I was sat in a teppanyaki restaurant in Paris (I know, who eats Japanese food in France?) and the couple sat next to us were openly laughing and staring at my dire lack of chopstick skills and they had to give me a pair that were taped together so that I could use them like pincers. Oh, the shame! Aww thanks so much! Haha, after all my sketchy tofu experiences I didn’t think I’d ever feel the same way, but I think I’m a believer too! Hi Aliza, it’s a blend of spices. It usually contains cinnamon, cloves, star anise, fennel and szechuan pepper. I can usually find it at any large supermarket. Hope that helps! You are so funny, Sasha! Thanks for sharing. I enjoyed your writing style. I gave this recipe a go today and it was absolutely ahmaaazing! I loved it. I actually added some peanut butter to the sauce and it elevated even more. Love this recipe. Will definitely be a staple in my recipe book.